In our family, we don’t believe in cribs. I’ve never seen any of my 6 nieces or nephews in one. Cribs confine babies to small spaces and hinder their movement and development. It also restricts a baby’s vision because they cannot see clearly past the wooden poles. All they have is an empty white ceiling to stare at. No wonder babies will stare at a mobile all day long, because they have nothing else to look at. Parents believe mobiles are great for developing their baby’s vision – it is, if that’s all they have to look at! Up to four months, our babies slept in baskets and co-sleepers at night mainly because we lived in a tiny 400 sq ft house and didn’t have much space to work with. The basket and co-sleeper were fine when they were tiny infants, but I could tell it was cramping their style. And it wasn’t until I put them on their own mattress that I saw just how cramped they were. As soon as we moved to our new 1200 sq ft house, we put them to sleep on a twin mattress. I saw just how much space a baby needs to move around, even in their sleep. I couldn’t imagine Mackenzie turning 360 degrees in her sleep until I witnessed it! When you don’t give them space to move, they don’t. But when they have the space to exercise, they do and it really helps their development. I have found that since they’ve been sleeping on the low floor mattresses, their overall movement has increased and improved. The other morning, we found Brooke (5 1/2 months) had ‘crawled’ off the mattress (we put a thick rug next to the mattress so it wouldn’t hurt if they fell). I figure she probably put one limb down and then gravity helped the rest of the way, but, in either case, she wasn’t crying, instead she was working hard making her way somewhere (we think perhaps to the candy store) but never made it there before we caught her! The first two months, the babies spent most of their time in our bed or on the living room sofa, which is where I spent most of my time. At 3 months, as they started moving more and more, we devised a day ‘bed’ (mat) on the floor for them that consisted of two thick wool blankets, some towels and a regular bed sheet on top. It was about 5’ x 3.5’. Whenever they were awake, we would put them on this mat on their tummy. As they’ve grown, their mat has grown to 8’ x 3.5’. This mat gives them ample room to move around. 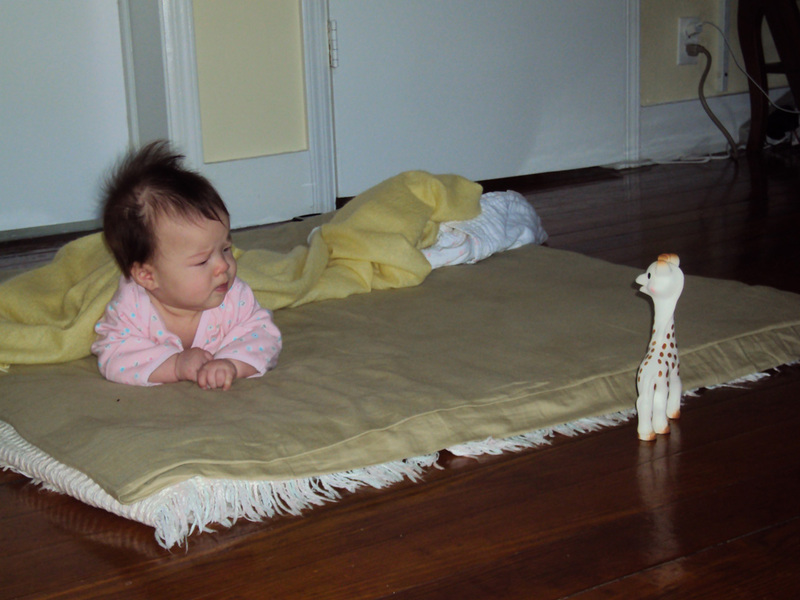 At four months, Mackenzie had slithered 5 feet from one end of the mat to the other end. At five months, Brooke slithers around the perimeter of the mat in a circle. I think having room to move helped their development whereas many babies at this age are still confined to mother’s arms, cribs, swings or baby car seats and never get a chance to move much on a open, flat, hard surface, which is what they need to move properly.